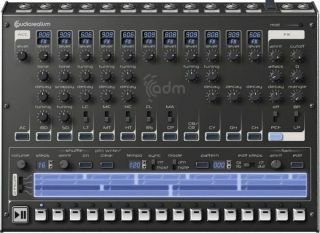 Mike Janney is the founder of AudioRealism, the company behind a host of quality vintage gear emulations, including the ADM drum machine and ABL2 bassline synth - which has recently been released in Reason Rack Extension form. How did you get started in the world of programming? "I started programming at the age of 10 on a MSX. I didn't have any games, and when you turned the machine on, there was just this BASIC prompt staring at you. There was really nothing to do except start entering commands; for instance, COLOR would change the colour of the background. The next step was sticking that in a FOR loop, and I just kept going from there! "I then got an Atari ST. I started making music with trackers, so I began trying to synthesise various sounds like bass drums by writing sine waves to files. I had no idea what I was doing at the time, but as long as it sounded cool, I was happy. "I got started with DSP programming in the demoscene about 1994. We would write intros (demos that are usually of 4KB or 64KB in size). We had to synthesise sounds for the music as there was just no space for samples." AudioRealism has emulated several iconic Roland x0x units (TB-303, TR-909, TR-808, TR-606). Why the focus on these? "I certainly like the sound of Roland gear, but we're not specifically trying to only emulate the x0x boxes. It's more like: these machines sound good, but why do they sound good? What can we learn from them? I think the goal is to generalise this and use those techniques for new plug-ins. "But the fact is that x0x boxes are still very popular and people know what they are and what they can do, so they come to us (or our competitors) when they're looking for those kind of sounds." Your products feature built-in step-sequencers. Is this concept still relevant in 2012? "Step-sequencers are about workflow. While you can certainly program the synths using the DAW's sequencer, there is something cool about programming the pattern from within the plug-in. "In the case of ABL2 (our 303 emulator), the built-in sequencer manages the note lengths a bit more properly than the host does, but this is kind of nit-picking. You can pretty much program a perfect 303 line in the piano roll of your DAW." "We just finished our first Rack Extension for Reason, which is a port of ABL2 - users were asking for this. It was kind of rushed, but we got some help from Propellerhead in order to get it ready for the Reason 6.5 launch. Before that, I was investigating some new filter technologies that I think will end up in products. "We want to do more of everything, naturally. I've been promising to update ABL Pro for years, and we've also got 64-bit versions coming out (ABL2 is already in beta for 64-bit), updates to the iOS apps and more REs planned. "A lot of time is going into unifying our code frameworks so that we can reuse code between all these platforms in an efficient way. But this is mostly technical stuff. A good plug-in, in my opinion, needs a huge portion of creative stuff also."